6:30 am-leave to go to Student teaching with my NCTE tote and lunch bag in frost-bitten hands. 7:38 am-enter school and learn in 5 more minutes that my first day will be with a substitute and we are watching a movie, all day. 8 am- 12:22 pm-watch the beginning of “Brian’s Song” 3 times. My days are long, my body is exhausted, but I wouldn’t trade it for the world, especially not after day two. Though I was not expecting a substitute teacher for my first days as a student teacher, I learned a lot. Though I wish we didn’t just watch a movie the first day, I was able to observe my students and get a read from them about what they like and don’t like, their sense of humor, and their insatiable curiosity about new things and people. I had lunch duty the first day, and many of my students flagged me down to bombard me with questions about who I am and how long I will be at the school. Already, I love them all; I know I will cry a little when I leave them.The sub is amazing. I sincerely love this woman, and I am glad I had the privilege of meeting her and working with her. After the first day, I was so bored that I was not really looking forward to the rest of the time that I would be observing. I have learned. It’s amazing to think about how much I have learned in the past two days. I want my students to learn from me as much as I have learned from them. After today, I learned how great it can be to be a teacher. I messed up presenting an activity one period, but was able to make up for it in the next period. My kids were so good to me. I cannot wait to get into my own classroom. I feel oddly comfortable in the classroom. I say “oddly” because I don’t think I should be so comfortable already. I think I should still feel like I am floundering and trying to get my a grip on my surroundings, but I am not and that scares me. I would like to dedicate this blog to my methods professor because she helped me find who I am as a teacher. 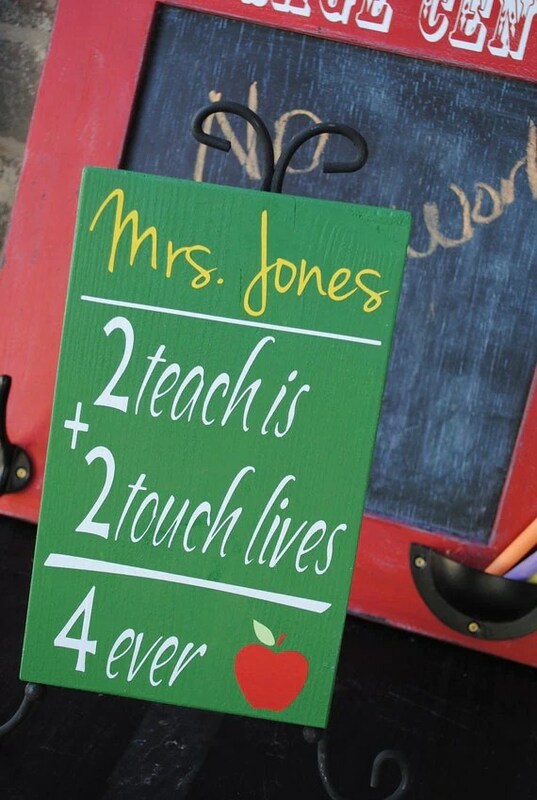 Without her, I wouldn’t be a student’s teacher, but a teacher’s teacher. Mr. Richard Kent takes us through an in-depth and inspiring look at a portfolio classroom. Room 109 has helped me make some decisions in how I will attempt to create my first classroom. I have a better look at what my class might just look like, now. This book was very well written. A fair few questions about portfolios came to mind as I read and they were subsequently answered. 95% of them, at least. This book is also handy for a resource-filled book. As great as Kent’s classroom appears to be, I do not think I would be able to pull it off quite like he does. I need to find the means to make a class like this work for me. This classroom needs to have a air of fun around it, and I’m not normally called, “fun.” Regardless of my fun levels, I still plan on using some of Kent’s ideas in my future classroom. I suggest this book to any future or current teacher who is looking into portfolio classrooms. This is a great book that can act as a great mentor text. One thing, however, that concerned me with this book is how old it is. A lot of things have happened in the education world since this book was written. Also, a lot newer more technology has come out since this book. If Kent is still teaching, would love to see what Kent is doing in his classroom now. This is a short blog for a short book. Also, next up is a dedication post!! What’s on my Agenda for Blogs? 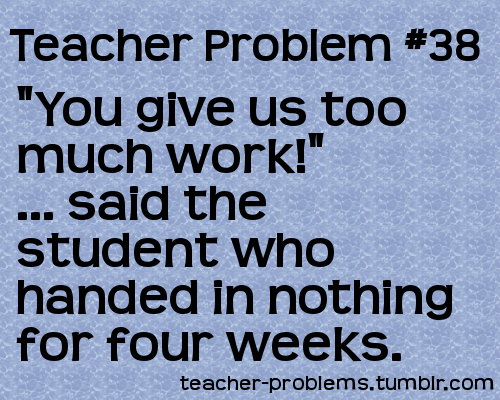 Why, it’s you ENG461! To be perfectly honest, this is my second time typing this blog. I was literally 80% finished with this blog before my computer/ internet connection wigged out and completely deleted my draft. So, lucky readers, you might just be getting an abridged version of this blog. Isn’t he cute?! Also, he is the thing I found to be most random. 1980’s Style Classroom Management- An Explanation? Tuesday, I was digging around in the “Free Books” book case and I found a gem [!] of a book on classroom management. 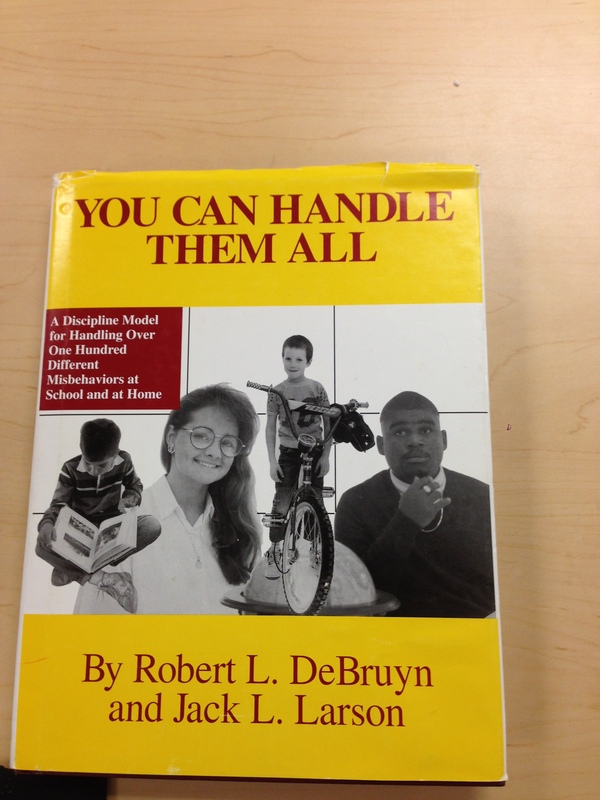 Let’s begin by analyzing the title of this book: You Can Handle Them All. 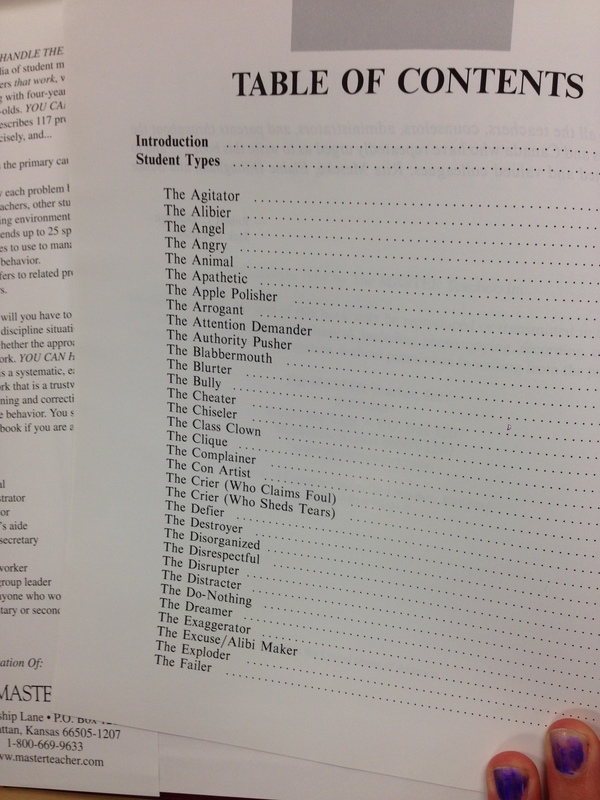 In the 1980’s, when this book’s copyright is, the professional development books consisted of “handling” students. I think this makes so much sense. Many of my own teachers are the product of this way of thinking. One of my high school English teachers did not care what we did as long as we did the worksheets, stayed in the classroom, and were good when the principal game. We were handled so that we never complained about that class. I was not in love with English because of my high school experience. Actually, the only reason I came to the English department in college is because I spent more than 85% of my childhood with my nose in a book and I wanted to be able to share that love with others. Before I get back to the book, I need to address the concept of “spider webbing.” In my literary criticism class, we are discussing feminist theories. One theory we learned about was how the female brain functions. According to this professor’s research, a woman’s brain goes from A to A1 to A2 to A3 then to B then B1 etc… all the way to the point trying to be made. In short, female brains go through several different thoughts before ending at the point. Male brains, according to this same research, go from A to B to C etc… until they get to the point. Any and all of my blogs can be used as evidence for this theory. So after that little blurb, back to the book from the beginning. 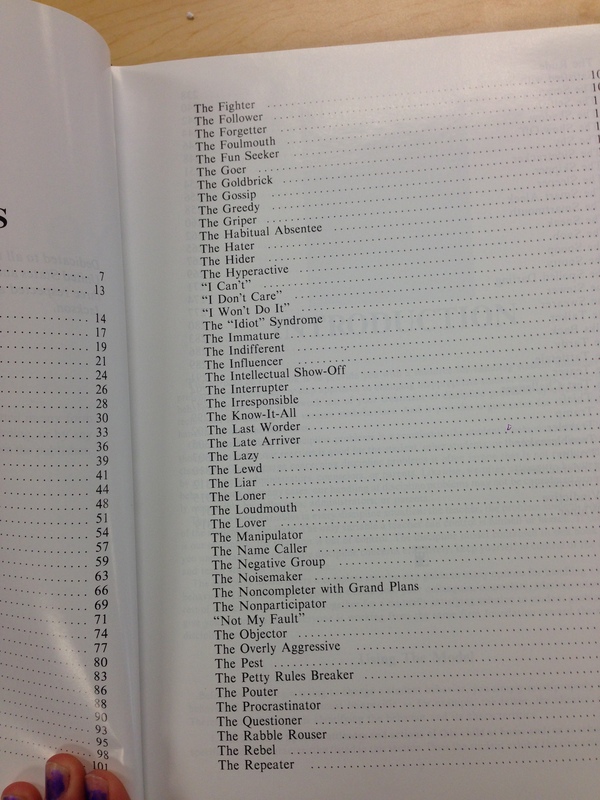 The “Table of Contents” is actually an alphabetical list of the 101 behaviors addressed in the book. Just by reading the “Table of Contents,” you will understand what I mean when I say this book is extremely politically incorrect. My “favorites” from this page include:The Apple Polisher, The Alibier (which different than the Alibi Maker? ), The Blabbermouth, The Chiseler, The Crier(s), and The Failer. Just a few “favorites” on this one: The Tramp, The Vindictive, The Underachiever, The Spoiled Darling, The Sleeper, and The Snoop. 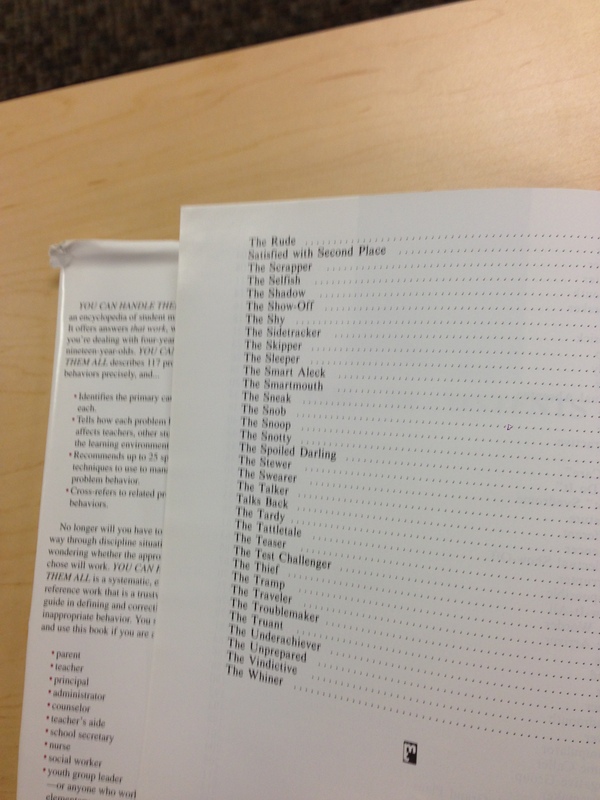 I think the way this book is set up and the way it coaches teachers to instruct explains a lot of teacher’s methods. Many behaviors in this book are addressed in stereotypical fashion with no real sense of getting to know the individual student. I just feel it all makes sense! I might have died for a minute from all the laughter. HAHAHA Oh my gosh! WATCH IT! Before any of you dear readers try to jest at my use “literally,” this blog consists of things I would give my life for without much hesitance. Also, I hope the majority caught my reference to The Fault in Our Stars by John Green. Before I get into the meat of this metaphorical sandwich, I would like to take a moment and discuss The Fault in Our Stars. Cool?-Great. Alright, if you have not read John Green’s The Fault in Our Stars, do it. Also, stop reading this blog because their are plenty of spoilers here. I know a lovely lady who adores John Green’s work and would love to meet him some day. If you haven’t read the book in question, rent it or borrow it or buy it and then read it! Last warning: SPOILER ALERT! !–Just kidding, no real spoilers, kinda. How does this tie into things I would die for? Well, that’s a bit of a stretch, I admit it. I just really loved that book and it reminded me of death, so yea. My dear friend, Maggie, just blogged about things she would die for. I loved the idea so much that i promptly stole it. She asked for three things we would die for, but I might not be able to comply with three. As a future educator, I know that if the situation ever arises where I might have to die to save my students, I will gladly lay my life down for them. They are my kids and I will not let them perish before I can see them grow and put what I have taught them to good use. I do not wish to run for Miss America, but I would do this in a heart beat. If my death brought peace, I would throw myself on a grenade for people just to be happy and at peace with each other. I just get really tired of either being a jerk or other people being a jerk to me. For those of you who know, I am an animal lover!! I love love love animals! I kind of want a pet bobcat some day. I would gladly die so all animals could have a safe and loving home to go to. 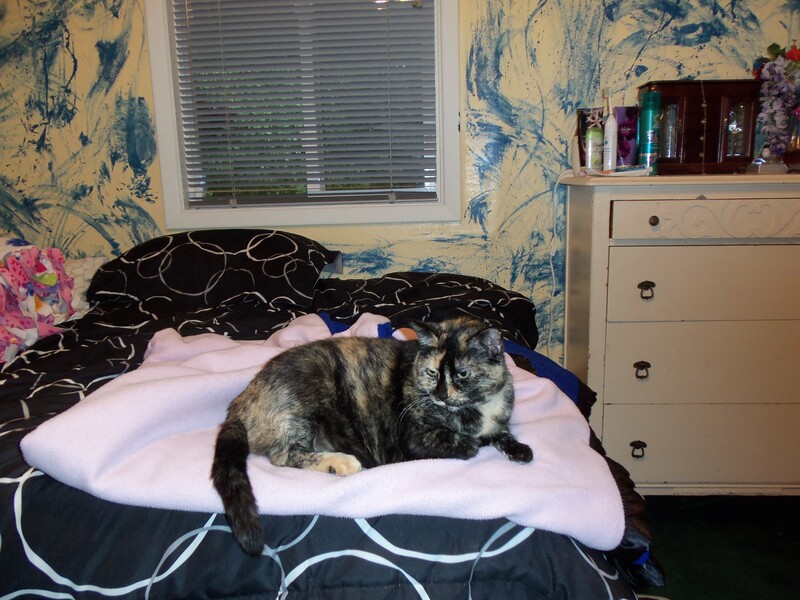 Fact about me: I try hard not to judge people, but I will openly judge someone based on how they treat an animal. I love the furry kids!! I really do not have much to say on this one. If I can save someone, I will do my very best to do so. If the choice became mine, I would want to give life to another over my own. I think that’s it. Have a great one!